Around 1850 James Chambers purchased 6 1/2 acres and formed and named Chambers Street. 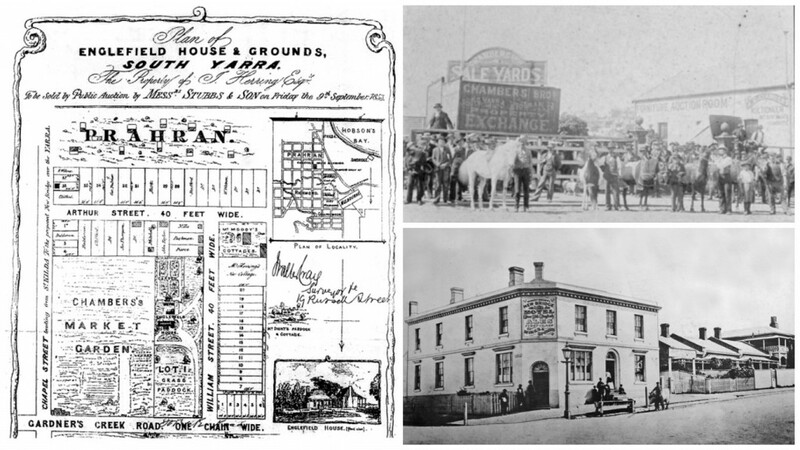 James Chambers ran the Ayres Arms Hotel which was on the south west corner of Chapel Street and Toorak Road where Country Road now stands. The family ran a large market garden and auction rooms selling cattle, horses and carriages. In 1857 the street was declared public highway and there were 10 timber houses. Sadly most are now replaced. Number 13 was one of the last to be demolished; it was built prior to 1855 with a double hipped iron roof covering an earlier shingle roof. It also featured a pair of polygonal window bays and a dairy operated from here in earlier times.